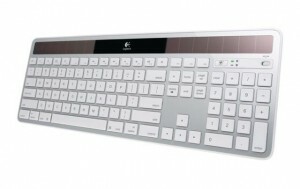 My original wired iMac keyboard delete key broke, so I considered replacing it with a wireless keyboard. Unfortunately the Apple keyboard is terrible for me without a proper numerical keypad, so I looked at alternatives and decided to get the Logitech Solar Keyboard K750 and I am really satisfied with it. The look matches the iMac design, it is wireless with a proper numerical keypad, no need of batteries thanks to the solar panels, and it also has a unifying small usb connector so that you can connect all your logitech devices to the same usb instead of needing several ones. If you use Bootcamp and Windows, you might have issues with F1, F2 keys not working properly. Just download and install Logitech’s Setpoint software, and everything will work as expected.